Those flower power songs had a theme. 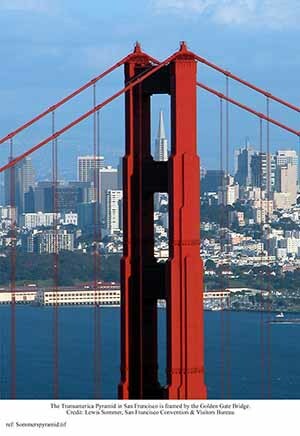 San Francisco, to them, was not so much a city as a state of mind. It was not defined by landscape, striking as the Golden Gate bridge and the islands, not just Alcatraz but its less well known counterparts are, and the alpine streets through which speeding cars bounced in Bullet and other chase movies, but in the smells, sounds, and the people. It is best viewed through the scrublands. 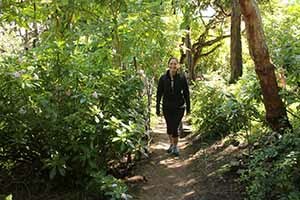 You might not even be aware of them, but the narrowest of the Streets of San Francsico pass through the urban bushland, up steps, past people’s back gardens and past various ornaments and pieces of public sculpture of which visitors would be unaware. 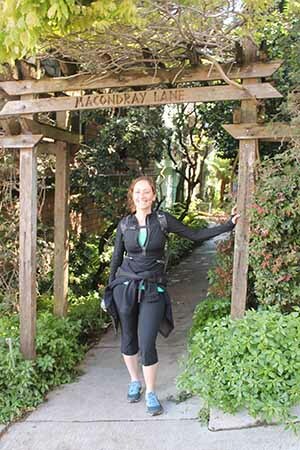 Alex Kernin of Urban Hiker SF conducted us along the way. In between the bushes and ever changing foliage, the view changes. 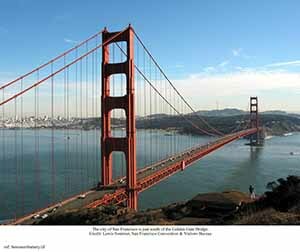 Snatches of the Golden Gate bridge and infamous Alcatraz islands can be glimpsed, but San Francisco is more than its postcard scenes. The urban staples such as church steeples can be caught and if the view tires you out, you can always count the calories that you are losing. One of the trails involves a climb of over 170 steps. You get the impression that people have to be fit to live in San Francisco, with its hills, steps and chilling Pacific winds. You cannot carry a Louisiana belly if you climb through these streets on a daily basis never mind tackling the steps through the bush. 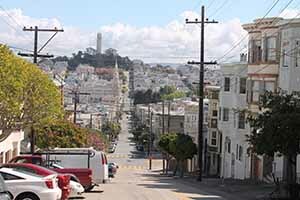 San Francisco people are fitter and mentally more agile than their counterparts elsewhere. It might be imagination, it might not, but n a city and is largely the creation of someone’s post Apocalyptic imagination after the fire of 1904, imagining the people and the culture to match its landscape is a useful and rewarding pursuit. Flower power has been consigned to the cliche book of San Francisco, a phase of history like the gold rush or the fire that had a defined beginning, middle, and, we imagine, an agreed end. Or maybe like that seafood menu, it doesn’t have an end. .You can still find the residue but, interestingly, you have to look hard. I always found it fascinating that the best place to revisit the summer of love is in the district of Haythe. If San Francisco was a meal it would be breakfast. Amazing fruit, eggs Benedict, and all the trappings that its Pacific European culture entail. The city has over 5,000 restaurants, they say closer to 6,000. They are at every corner to every taste and price range. It never stops. When you walk the streets the most distinctive noise through the traffic is the sound of the tram cables cranking under the paved roads. Tourists, who comment about the large number of street people are demonstrating the city and its reputation not just as a centre of counter culture but a bastion to tolerance in an increasingly angry United States. And the smells, the sea air ensures that these are special too. San Francisco’s restaurant and kitchen culture is inclined towards the east, and its huge populations of Asian ethnicity. And this, in what people often call, the most European of American cities. Entertainment is different here. Burlesque shows fronted by a brasher cast of characters than you find in Hollywood obsessed Los Angeles, and the ubiquitous peacocking transgender types, making a night out truly unique even when the (quality falls short of what might be found elsewhere, you know you are in San Francisco. Eoghan Corry flew to San Francisco with Aer Lingus, which resumed its direct service to San Francisco last May. For lowest fares see aer.lingus.com.